Samples taken from an area near last week's explosions are seen on a table at a monitoring station to check for environmental pollution in Tianjin, China, August 18, 2015. Cyanide levels more than 350 times the acceptable limit have been found in waters close to the site of recent deadly explosions in the Chinese port city of Tianjin, officials said Thursday. The city's drinking water, however, remained safe, Deng Xiaowen, director of Tianjin's environmental monitoring center, told a media briefing aimed at easing public concerns. "At present, all cyanide-contaminated waste waters are kept within the blast site." he said. The water will not be drained until it is cleaned up, officials said. Outside the alert area, six of 16 testing sites also recorded cyanide levels, all of which were within reasonable limits, Deng added. The public, however, remained concerned as pictures of dead fish have circulated on social media. In response, Deng said his center has launched an investigation and will make public its findings as soon as authorities determine what caused the fish to die. The mayor of Tianjin said his administration has enacted a plan to relocate chemical plants away from the Binhai New Area, where a warehouse at the center of the devastation was located, into the Nangang Industrial Zone, south of the Tianjin Port. "This designated chemicals district will be an equivalent to the design of Singapore's Jurong Island. The deployment of a public safety island will also be facilitated – a plan we've already activated," the mayor, Huang Xingguo, told another media briefing. The State Council also has conducted an overhaul into the nation's chemicals industry, pledging to crack down on businesses which have violated laws and regulations, and on those which should be held responsible for the blasts, according to Huang. A firefighter walks among damaged vehicles as smoke rises amidst shipping containers at the site of explosions, at Binhai new district in Tianjin, China, Aug. 14, 2015. The mayor's proposed special zone, nevertheless, isn't something new in China as there have been similar establishments in Shanghai and Nanjing, according to Liu Yuhang, secretary general of the hazardous chemical logistics branch under the China Federation of Logistics & Purchasing. Such a model in Tianjin should bring clustering advantages to manufacturers including logistics operators as they can keep the cost of their investments down while maximizing operational efficiency. In terms of safety, however, this model is not absolutely risk-free, Liu said. 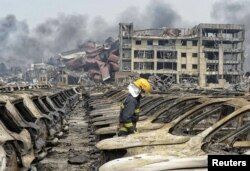 "After such huge quantities of chemical products are put together in one special zone, we wonder if a bigger-than-expected chain reaction will be triggered should a small scale accident occur," Liu said, adding, "So, I think more discussion between the [Tianjin] government and the private sector is needed." To ease safety concerns, Liu is urging authorities to pay attention to the problem of weak enforcement at the local government level since tight regulations promoted by the central government have been in place to regulate the sector. The logistics sector handling hazardous chemicals has come under greater scrutiny since the blasts occurred. According to the federation, as of last year, China had 12,000 licensed logistics operators working near chemical producers along the southeastern coast. On average, they transport 200 million tons of dangerous chemicals across the country, posing a severe safety concern, Liu said. The experience of Singapore's Jurong Island, thus, shows that the professional management of such dangerous chemicals is key to preventing accidents as devastating as the one that occurred at Tianjin Port, says Jack Hsieh, executive manager of a petrochemical industry association. “Jurong Island has tight security; similar to that of a military base; you have to go through checkpoints to enter the island," said Hsieh. In terms of emergency response, the island's fire stations are equipped with capable and sufficient personnel while drills are conducted periodically to ensure firefighting practices and standards are up-to-date, he added.